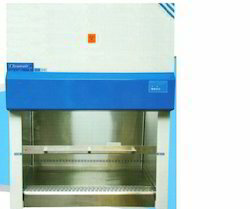 Laminar Air Flow Workstation (Vertical) Complete S.S.
Used in general labs for testing purpose these vertical laminar flow cabinets provide reliable protection for samples and work processes for a multitude of applications. These cabinets are premium selection for discerning researcher, offering a combination of value, high quality construction, low operating noise levels, and a wide product range to suit all budgets, from the industry leader. Laminar airflow is designed to move particle free air over the aseptic operating field in one direction. It can be designed to flow vertically or horizontally and is usually combined with high efficiency particulate air (HEPA) filters. HEPA filters remove particles > 0.3 micron in diameter with an efficiency of 99.97%. SS Table 304, Size : 2’ X 2’. 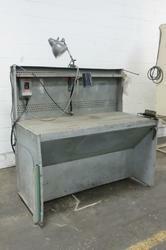 We manufacture Laminar Air Flow Bench used to keep laminar aur flow machine with following features and applications. We are capable to manufacture all type of Laminar Air Flow Bench i.e. - Switches : Microprocessor based Touch Panel for Blower, Fluorescent light & UV light. (UV light with Timer)&Mortorized Front door of toughen glass. - Pre-filter : 99.00% down to 5 micron. - HEPA Filter : ISO 14644 Class 5 (Class 100) 99.97%-99.99% down to 0.3 micron. Mesh guard for protection of HEPA Filter. - Noise Level : 60 decibel ± 5%. Bench-top and Free-Standing Vertical Laminar Flow Hoods incorporate 99.99% efficient HEPA or 99.999% efficient ULPA fan / filter modules that remove particulate airborne contamination to meet cleanliness requirements. Mystaire® MY-PCR prep stations are compact laminar flow enclosures that reduce the risk of sample contamination while performing polymerase chain reaction experiments.